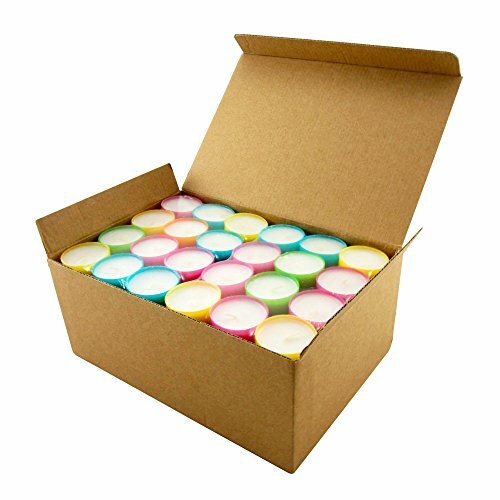 Package contains 96 quality paraffin unscented multicolored tea light candles with an extended burn time of 6 to 7 hours. Our wicks are lead free and 100% cotton, and each candle comes in it’s own brightly colored plastic case. These quality tea light candles can be used with any decor whether it be a colorful centerpiece for the holidays or a birthday party, a quirky cafe setting, or simply to add color to any room in the house. Stonebriar tea light candles will fit any standard tea light holder, or you can even create your own crafty candleholder out of mason jars, wine glasses, and even scrap pieces of wood. These tea light candles can be used for weddings, birthdays, anniversaries, and much more. The opportunities are endless when thinking up new ways to use Stonebriar's multicolored tea light candles.